If you've been following me for some time now, you know I love me some Thrive Market! At first one might think it's just another run of the mill health food something or another, but I kid you not- it's been one of the bigger blessings to our kitchen (and wallets)! 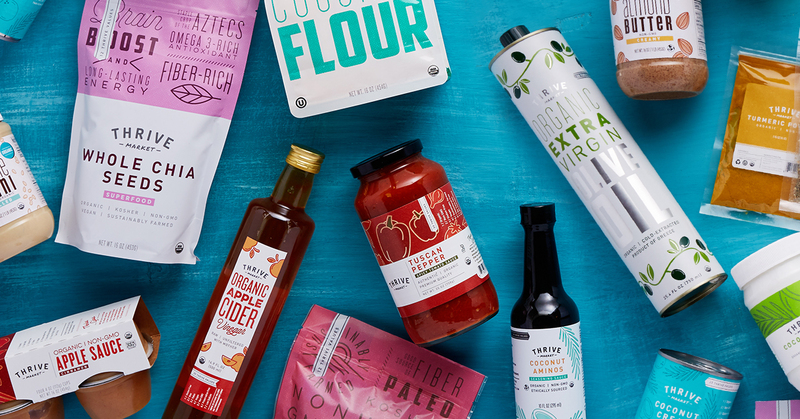 Put simply, Thrive Market is an online store that is sort of like if Amazon and Whole Foods had a baby. 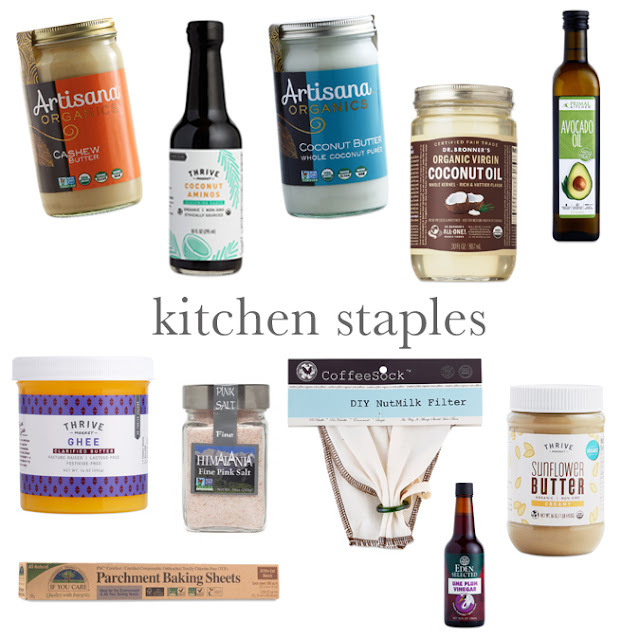 Basically it's a place where for a small yearly membership fee (like Amazon Prime or Costco) you have a crazy array of natural, clean, healthy foods and home products at your fingertips (like Whole Foods)... but with WAY CHEAPER PRICES! Like, 25-50% off the brands you love, no coupon or code needed. Forever. There is a minimum you need to get free shipping ($49) but if you add to your cart as you run out of things (think of it like your own grocery list) after a few weeks you will totally meet that minimum. AND they are constantly giving away freebees to orders over $59! Which again, we hit every 2 or so weeks. Then you just place your order online or via their app on your phone (this is what I use and it's SO easy!!) and in a few days it is delivered right to your door step. And And And! Thrive will give you 25% off your first order (and a free 30 day trial)! Sign up here. They have all of your favorite brands too! 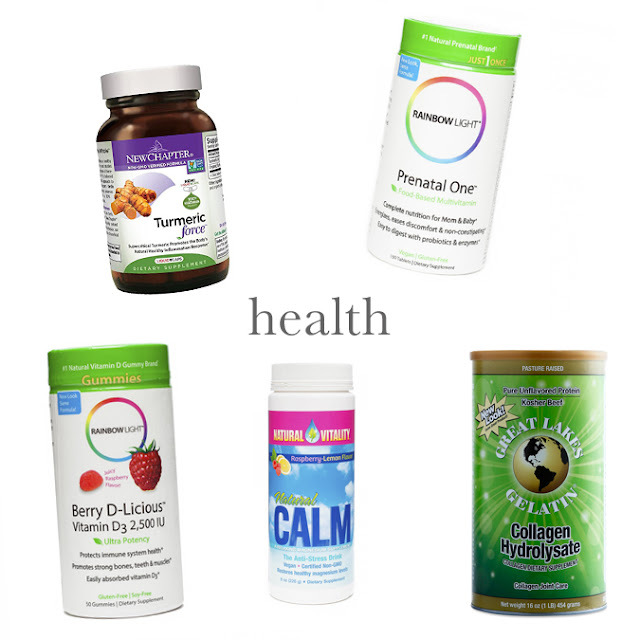 Like Primal Chocolate, Primal Kitchen, Artisana, Four Sigmatic and Navitas Organics amongst so many others! All at a really nice discount. And even more discounted? Their own name brand products, which we have tried and also love! It's not just food either. 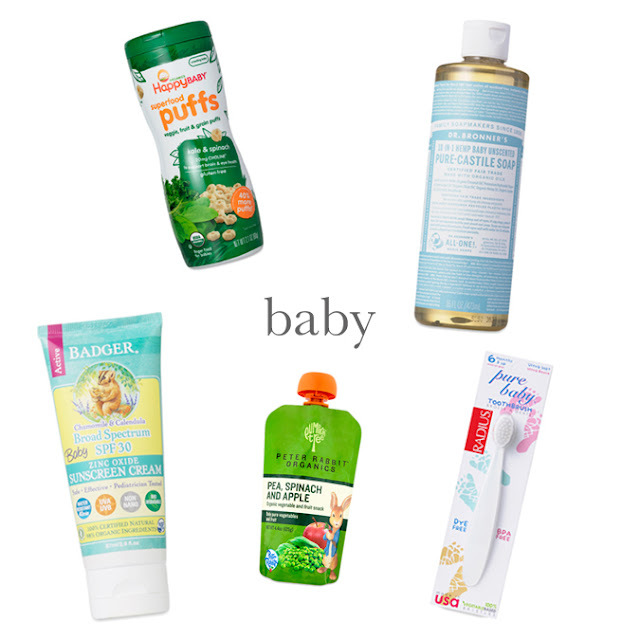 There are bath and body products, baby stuff (like Honest diapers! ), home necessities (like sponges or Mrs Meyers cleaners) etc. Lots to love. I thought it might be fun and informative to show you guys the absolute 'must haves' my family uses the most, so you can see not only what else they carry but reference and price check (and find out that their prices are giving other companies a run for their money)! happy baby superfood puffs // These are a great wholesome snack whenever we're out and Luke's getting hungry. dr. bronners baby unscented pure castile soap // We used those other "natural" baby soaps and you guys, nothing beats this stuff. Check out these ingredients! 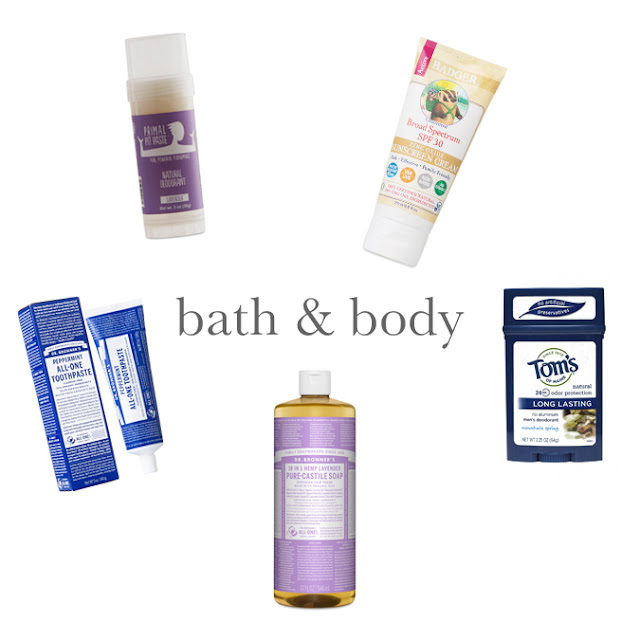 Water, Organic Coconut Oil*, Potassium Hydroxide**, Organic Palm Kernel Oil*, Organic Olive Oil*, Organic Hemp Oil, Organic Jojoba Oil, Citric Acid, Tocopherol *CERTIFIED FAIR TRADE INGREDIENTS! He has never broken out, and we dilute each bottle so that it goes a very long way! badger broad spectrum baby spf 30 sunscreen // We love Badger brand sunscreens pretty much because they have the lowest EWG score. This one in particular has a score of 1. 1! peter rabbit organics pouches // Can't beat these clean ingredients: Organic peas, organic spinach, organic apples, organic lemon juice concentrate. pure baby toothbrushes // Ever since we started brushing Luke's teeth, we've used this brand. Soft, gentle and small enough for him to use himself! primal pit paste natural deodorant // I've been trying to find a more natural deodorant for a while. None of them ever worked. Sad face. And now, after having a baby and my hormones being the most out of whack, I'm a sweating, stinky mess. This is the first, clean ingredient deodorant that works for me! Took a few days for my body's pH to realign (a.k.a. I was a little stinky) but now I'm good to go! Word to there wise though, hold it under your armpit for a little bit to heat it up before moving around. Or else you'll almost rip your skin off! Hahaha. dr. bronners lavender pure castile soap // We use this (and the peppermint scent) for everything from hand soap to body soap and dish soap! A little goes a long way so either dilute it or use a very little bit! toms mens deodorant // The smell alone gets me. I love the way this stuff smells! But not only that, my husband swears it still works really well. new chapter turmeric force // For anyone struggling with inflammation, like those of us with Hashimoto's, this stuff is a life saver. Turmeric is a natural anti-inflammatory! Now you have to take the recommended dose every day in order to see a decrease in inflammatory pain, but it's worth it. Versus being used as a pain medication on the onset of inflammation- it won't work that way. This also removes harmful toxins in the body! Score! rainbow light prenatal one // I have been taking this since like day 3 of knowing I was pregnant with Luke! Haha. I took it all through my pregnancy and am still taking it through my nursing life. It's non-constipating (I know, I know....but it's a thing that happens!) and has never ever made me feel nauseous like some mega vitamins have. Plus it's all plant based and includes probiotics. natural calm // Magnesium is such an underrated vitamin/mineral, but man, it's such a thing to have! It helps ease stress, supports the thyroid, regulates muscle and nerve functions, blood sugar levels, and blood pressure and supports bones. All the fruits and vegetables used in their products are organically grown and this product specifically is sweetened with organic stevia. It's a delicious fizzy drink that you mix together yourself in the form of powder (into a glass of water). You can drink it hot like a tea or cold (my fave) and it just helps me calm down, sleep better and get ready for the night. great lakes gelatin collagen hydrolysate // Made from pasture raised, grass fed cows, this is a GREAT way to add a nice collagen and protein boost to smoothies, yogurt, oatmeal, etc. It melts in both hot and cold liquids! We use it everyday and love it. You'll see it in so many of my recipes, like lattes and popsicles and smoothies on my instagram! bees wrap // A newer love of ours, these all natural bees wax wraps are made to replace the use of plastic wrap in your home. I just tried the sample pack and am in love! Definitely going to get more of each size as we can financially do! now essential oil diffuser // One of my favorite diffusers! It lasts up to 10 hours, is easy to use and ionizes and cleans the air which is great for those who suffer badly from allergies! molly suds wool dryer balls // Toss out those dryer sheets (Seriously. Just google how terrible they are) and switch to these puppies. Even better- add a drop or two of your favorite essential oil to each ball and make your laundry smell super fresh! And no, with the exception of large blankets, we have had 0 problems with static cling. aunt fannie's cleaning vinegar // I received this as a free gift from Thrive with an order a few months back and have fallen deeply in love with this stuff. Let me list the ingredients for you: Lemon Oil, Litsea Cubeba Oil, Orange Oil, Peppermint Oil, Spearmint Oil, Sugar Surfactant, White Distilled Vinegar. Right? That's it. BUT IT WORKS SO WELL! Even sometimes still with my beloved Mrs Meyers, I get nervous with Luke using it and "helping". This stuff though- not a doubt in my mind. Spray away, friend. Help a mama out indeed! molly suds laundry powder // By now I'm sure you're noticing a theme- I love products that have the most natural ingredients possible. AND WORK. This stuff really works. Ingredients- sodium carbonate sourced from the Green River Basin in Wyoming, sodium bicarbonate, magnesium sulfate (heptahydrate), unrefined sea salt, and organic peppermint (mentha piperita) oil. Boom. artisana cashew butter // Our absolute favorite cashew butter around. So creamy!! thrive market coconut aminos // They carry other brands, but we've tried each of them and this one is super yummy for the best price. artisana coconut butter // Hands down the sweetest, creamiest coconut butter around. dr. bronners organic virgin coconut oil // I just can't even with coconut oil. It is LITERALLY my favorite fat out there. I use this for facial and body things (think oils, sprays, cleansers), Luke's homemade toothpaste, hair stuff and food. primal kitchen avocado oil // You know how much we love our avocado oil, right!? One of the better "neutral" flavored oils out there! It's great for dishes where you don't want to add any extra flavor, for example- homemade mayo or even a salad dressing! You wouldn't want to use olive oil in something like homemade mayo, because it would overpower the flavoring, and coconut oil would harden in the fridge, so avocado oil to the rescue! thrive market ghee // Yes, they carry other, more reputable brands of ghee, but we've tried them all and this one is super tasty, cheaper, and also made from pasture raised cows. himalania fine pink salt // Salt shouldn't be a bad guy- if you're using the right kinds. There's a lot out there that can be extremely beneficial to us, but we love this one for all of the natural minerals and vitamins it contains (like iron)! eden ume plum vinegar // This one might be new to you and you might be going, "What in the world is this?!" and let me just answer you by saying it's this amazingness in a bottle! It's fermented (!!) ume plums! A little tart and VERY salty, this vinegar adds just the right little umami flavor boost to any of your favorite dishes. thrive market sunflower seed butter // I've tried a LOT of sunflower seed butters and although I am sad they don't carry SunButter brand, this is a close second! Make sure the ingredients are just sunflower seeds! if you care parchment baking sheets // Pre-cut little helpful friends. Just pull a sheet out with grace and never have anything stick to your pan again. chico bag snack time reusable pouches // Still with the theme of living as green as possible, we bought these in an attempt to cut out the plastic sandwich baggy usage. We were going through a lot! Great thing about these guys is you can fold it over once and hold a sandwich or fold it over a few times and use it as a little guy snack bag. 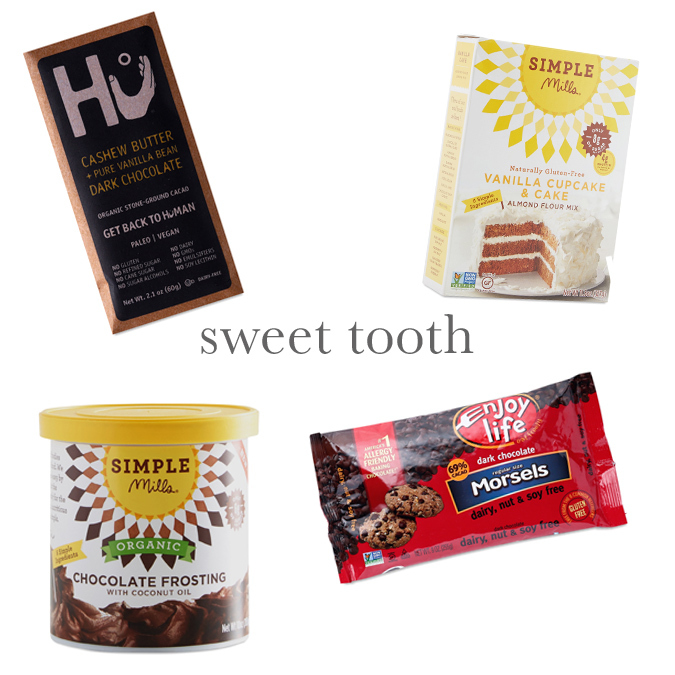 beef stick snack mates // I'm always looking for healthy ways I can quickly throw a snack in my diaper bag for when we're out and need a pick me up. These guys are so yummy and perfect for little hands (or mama and daddy hands too)! And seriously, they're made with both grass-fed AND grass-finished beef (meaning the cows have eaten ONLY grass, not finished with grain), honey (not sugar!!!) lemon peel, sea salt, lactic acid, celery juice powder (celery powder, sea salt), garlic powder, onion powder, white pepper, ginger, black pepper, and in collagen casing. I mean- what?! jackson's honest coconut oil sweet potato chips // Check these ingredients: Sweet potatoes, organic coconut oil, sea salt. Boom. mamma chia chia squeeze pouches // For mama and baby! hu cashew butter and pure vanilla bean dark chocolate // Words don't do this chocolate bar justice. It is (and I say this whole heartedly) literally my favorite chocolate bar in the entire world. AGH this is so good. Order 100 at a time, you'll thank me. simple mills vanilla cupcake and cake mix // I literally just bought more for my upcoming birthday, so my husband can make my birthday cake easily! And duh, this is PALEO!!! The ingredient are: Almond Flour, Organic Coconut Sugar, Arrowroot Powder, Organic Coconut Flour, Baking Soda, Sea Salt. Clean as a whistle. simple mills organic chocolate frosting // Also bought 2 of these for said birthday cake! Sure, this does have sugar but the rest of the ingredients are so clean! And made with coconut oil! enjoy life dark chocolate morsels // These guys are some of the best chocolate chips around. Yes, they have sugar, but that's it! They're free of every known allergen otherwise! So if this sounds amazing to you, you can sign up here and Thrive Market will give you 25% off your first order (and a free 30 day trial)!